PCB (Printed Circuit Board) Layout and Design Services - Golden Gate Graphics. Our motto—"Create a perfect duplicate of the engineer’s intentions." Golden Gate Graphics does graphics design for the electronics manufacturing industry—we design the artwork used by fabricators and assemblers to make printed circuit boards. The widely used term for a business of this kind is "printed circuit design service bureau." Although we are located near Denver, Colorado, our customers are located throughout the world. Because we do this right, an electronics manufacturer can build your next project quickly and reliably. Additional to PCB design, we provide schematic capture. This dovetails with printed circuit design, especially since we use the CAD software Altium Designer. Click here to read more about our schematic capture services. Over the years, that has been a very successful operating basis in our work with electrical engineers . 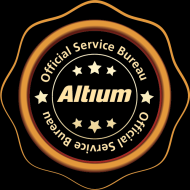 We are an official Altium service bureau. We use the latest Altium Designer 17 and support earlier versions 16, 15, 14, 13 and 10. If you are an electronics design engineer and have finished the schematic capture of your current project and need to get your circuit design manufactured as printed circuit boards, your next step is production of PWB artwork that will be used in the processes of your fabricator, aka board house . Golden Gate Graphics is your best choice for fast and accurate PCB design services. If you have drawings or sketches of your circuit and need your schematic capture done for you, we do that too. We design your electronic schematics and boards to be manufacturable, so your entire electronics project design costs less and gets built faster. We teach our designers how to streamline the PCB design process. The result: Your design gets done quickly and without errors. The product is not just "artwork." It's "Valuable Final Artwork" . (read on) Capabilities in Streamlined PCB Design. If you need help with electronics project design terminology, please check out our Glossary of electronics schematics and printed circuit boards: design and manufacturing.